William Frederick Cody was many things in his lifetime. He was a Pony Express rider, a hunter, a soldier in the Union Army, a civilian scout during the Indian Wars, and most famously, he was a showman known as “Buffalo Bill” (a nickname he had secured while supplying Kansas Pacific Railroad workers with bison meat). 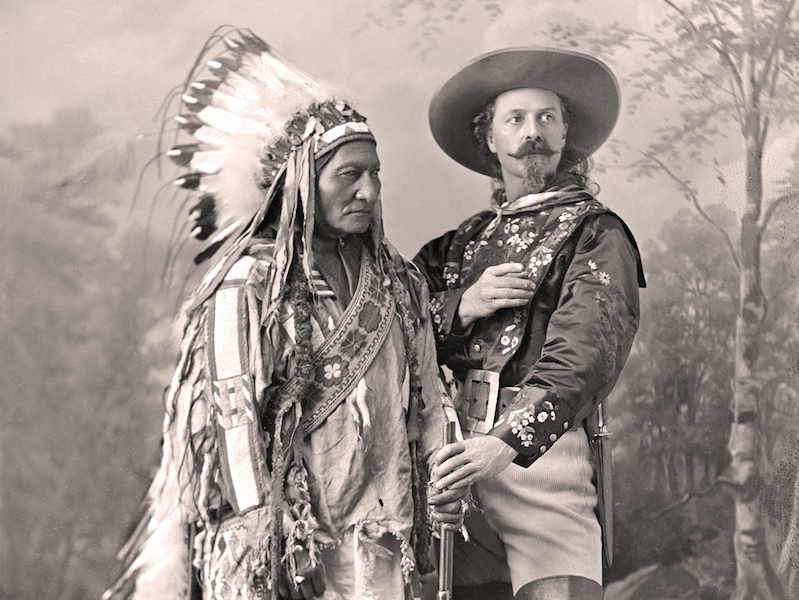 Cody’s show, Buffalo Bill’s Wild West, traveled across the United States and Europe, and featured an ethnically diverse team of performers in colorful (sometimes over-the-top) costumes. Horse stunts and feats of skill made for great entertainment, and shows often featured famous guests. Dr. William Frank Carver – a dentist by trade – toured with Cody and performed his innovative horse diving act, a stunt in which he would plummet on horseback into a pool of water from a platform 60 feet high. Annie Oakley was a sharpshooter and actor who headlined the show for 17 years. Perhaps the biggest star outside of Cody, she taught thousands of women to shoot and was an inspiration to little girls everywhere. Sitting Bull, the Sioux warrior (and later chief), was a star attraction in 1885. He was so famous that performing was unnecessary; he rode the arena once each show and charged for autographs. Over the years, there were many incarnations of Buffalo Bill’s traveling show. In 1893, a parade of horseback riders was added and the name of the show was expanded to Buffalo Bill’s Wild West and Congress of Rough Riders of the World. And in 1909, Cody teamed up with Pawnee Bill and his Asian performers to create Buffalo Bill’s Wild West and Pawnee Bill’s Far East. The success of Buffalo Bill’s traveling shows made him one of the greatest celebrities of his time. Today, the Buffalo Bill Historical Center (a world-class facility which contains the Buffalo Bill Museum, Cody Firearms Museum, Whitney Gallery of Western Art, Plains Indian Museum, and the Draper Museum of Natural History) in Cody, Wyoming stands as a testament to him and the culture which he loved. For more information, visit centerofthewest.org.